Awardees from the Sawtelle Nikkei community and their families with Consul General of Japan Jun Niimi (left) and 11th District City Councilmember Bill Rosendahl (back row, second from right). 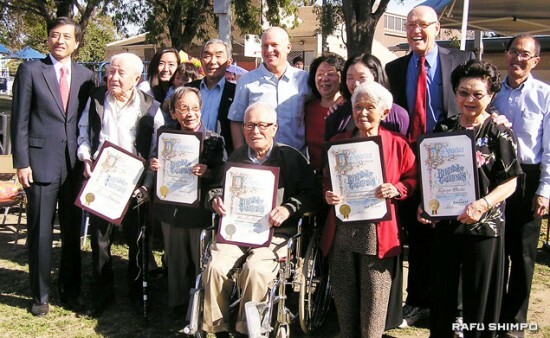 The Sawtelle Nikkei community honored four 100-year-old seniors at Stoner Park, where the cherry trees were near full bloom. Centenarians Torako Akutagawa and Stanley Ikeda enjoyed a performance of “Soran Bushi” by JIS students. The Sakura (Cherry Blossom) Festival was co-sponsored by the Japanese Institute of Sawtelle (JIS). The annual undokai, the sports day for the JIS, was held at the same time. In addition, Mary Misono, the office manager for 11th District Councilmember Bill Rosendahl, received special recognition for her work bridging the city government and the community. She previously served as office manager for Councilmembers Marvin Braude and Cindy Miscikowski. 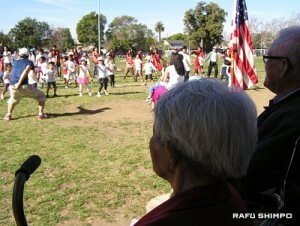 On March 2, more than 300 community members, including the West L.A. Boy Scout Troop 39, gathered to view the blooming trees, which were planted in 1994 by the Bay Cities Gardeners Association, a Japanese American group in the Santa Monica and West Los Angeles area. Historically, the park was the location where Japanese gardeners created a Japanese garden in 1932, and in the 1950s, the late Koichi Kawana, former professor at UCLA, took the lead in re-landscaping the garden with volunteers from local nurseries and gardeners who have maintained the garden ever since. 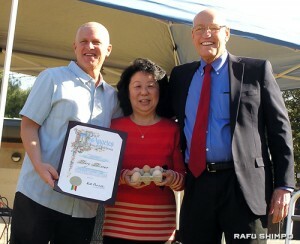 Mary Misono received special recognition from City Councilmember Bill Rosendahl (right). At left is Mike Bonin, councilmember-elect and Rosendahl's chief deputy. Local centenarians Torako Akutagawa, Stanley Ikeda, Mitsuo Kodama and Mike Shintaku were honored along with 90-year-old Jean Saito and 80-year-old Kimi Ouchi. At the end of the ceremony, over 150 children of the Japanese language school at JIS performed “Soran Bushi,” a fisherman’s dance, and the awardees watched their performance with a smile. 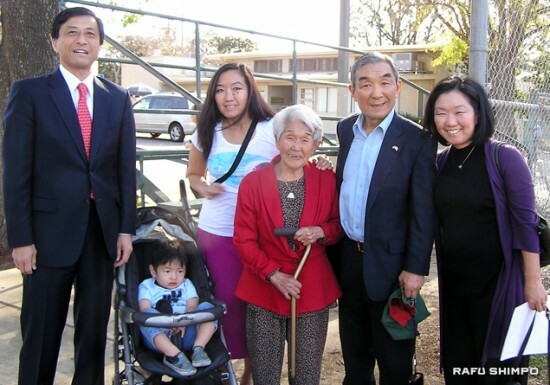 Consul General Jun Niimi with the family of 100-year-old Torako Akutagawa, including her 2-year-old great-grandchild, Rex Kiyoshi Shima. Pictured from left: Niimi; Rex; Rex's mother, Susan; Torako; Torako's eldest son, Yoshinori Akutagawa; and Yoshinori's daughter, Linda. Rex's brother, 5-year-old Ryan Hideyoshi, is not pictured because he was at Japanese language school. 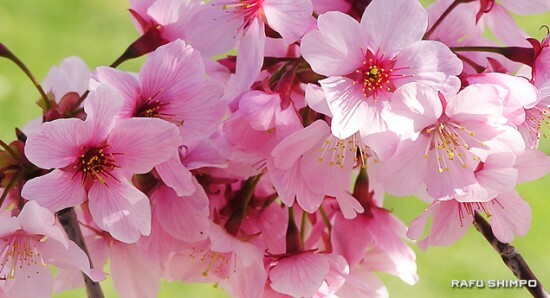 Cherry trees planted by a Japanese gardeners' group in 1994 are near full bloom at Stoner Park in West Los Angeles. Thanks for sharing our 100 year olds with the world. Thanks for Ryoko Ohnishi for writing the article. Sawtelle Nikkei community has much to feel good about in that members of the community cherish these popular citizens.